The study area to which the data corresponds covered approximately 0.70 km2 near the Seal Skerry headland in the northern sector of the FOW, focussed above the FLOWBEC device. Shore-based observational surveys were used to record the abundance and behaviour of black guillemots and European shags on the sea surface within the study area. A suitable vantage point was located on the Seal Skerry headland (59°10.295′N, 002°49.391′W) ∼5 m above mean sea level and ∼0.5–1.5 km away from the study area. 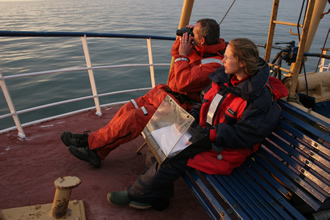 Having a vantage point <2 km from the study area assured that all seabirds on the sea surface could be identified to species level, detailed behavioural observations could be performed, and variations in detectability associated with distance and sea surface conditions would be minimized. Scans were only performed when the sea state was < Beaufort scale 3, and visibility was >1.5 km. Surveys consisted of either 10 or 20 min scans; 88 scans of 10 min length and 37 scans of 20 min length were performed over a total of 27 hr. The number of scans performed per day averaged 9.54, and varied from 0 to 21. The differing scan lengths represented the use of two slightly different scanning strategies which were being tested. The observations at the FoW sight covered the following dates inclusively: 13 Jun 2012 – 27 Jun 2012, 03 Jun 2013 – 15 Jun 2013, 18 Jun 2013 – 03 Jul 2013. No more than four hours of survey per day, to reduce the effects of observer fatigue. EMEC Fall of Warness High-Intensity Wildlife Observation Data is located in United Kingdom.